As promised last time, here’s the second half of my summer field notes. Today I’d like to introduce you to the rest of the reptiles and amphibians we’ve met here at Sweetfern. We’ll start with the smallest. I found these little amphibians under rocks and logs while we were clearing paths at the beginning of summer. 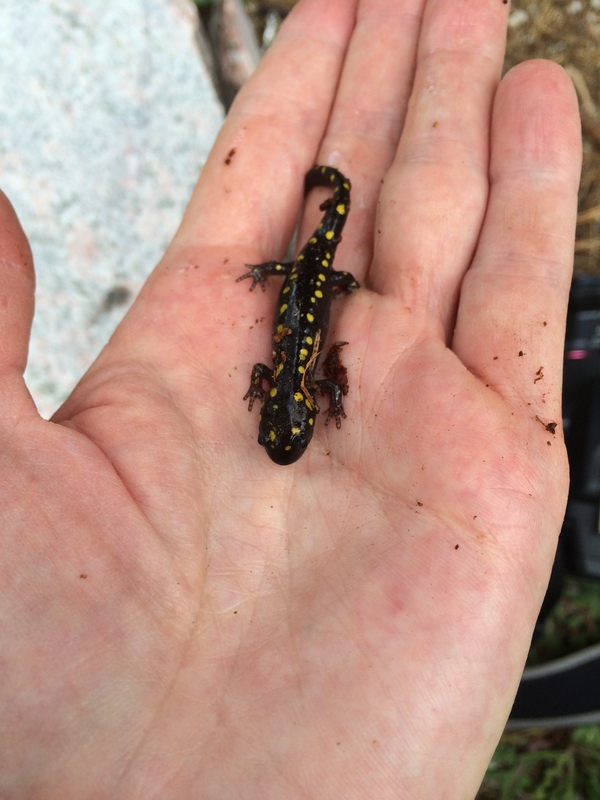 This first one is called, unsurprisingly, a yellow-spotted salamander or just a spotted salamander (Ambystoma maculatum). These little carnivores eat insects, worms, and grubs and can live for 30 years. They migrate to breeding grounds in the spring but unfortunately many of their migratory routes now cross roads so a large number are killed each year. Now moving on to something with a little more bounce, how about frogs and toads? … scientifically, toads are a kind of frog or Anuran. Frogs and toads are both amphibians, lay eggs in water, and begin life as tadpoles. Both are found almost world-wide. Most hop, but a few walk or run instead. Some climb trees. And we had all of that this summer. Right through spring and early summer the call of the spring peepers drowned out everything else we tried to hear at night. They’d start just before sunset and go all night long. Unfortunately, I never went out to the swamp at night to get a photo of one. 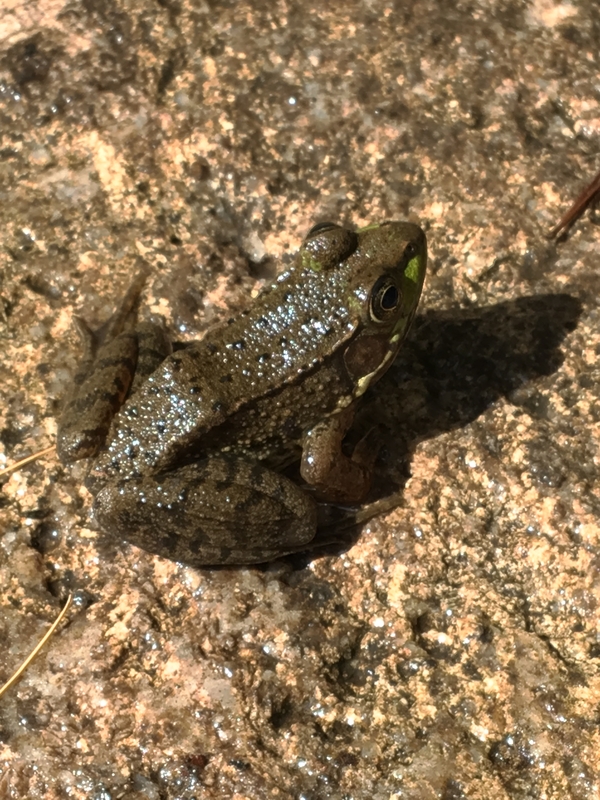 But I did manage to get lots of green frog pictures, because every time it rained they gathered in the rock puddles under the porch and I had to remove them before running the sump pump. There are five in this bucket waiting for relocation. One’s hiding. This guy (girl?) came in the night. It is quite possibly the largest American toad (Anaxyrus americanus) I have ever seen. It climbed up a sheer rock face, heading directly towards the porch light, probably in hopes of dining on some of the many moths and other insects gathered there. And this may be the most beautiful wild frog I have ever seen. It positively shimmered with a metallic coppery sheen. It’s a pickerel frog (Lithobates palustris), named for the unfortunate fact that it’s used for bait in catching those fish. I thought it was a color morph of a leopard frog. But after being corrected on Twitter, I learned to tell them apart. The pickerel frog has square spots that run in parallel rows down its back. The leopard frog can also be brown but has more irregular spots. There’s a good comparison HERE. This last frog was my favorite because I have never seen a tree frog in the wild. Just look at it! Is that the most exquisite thing? 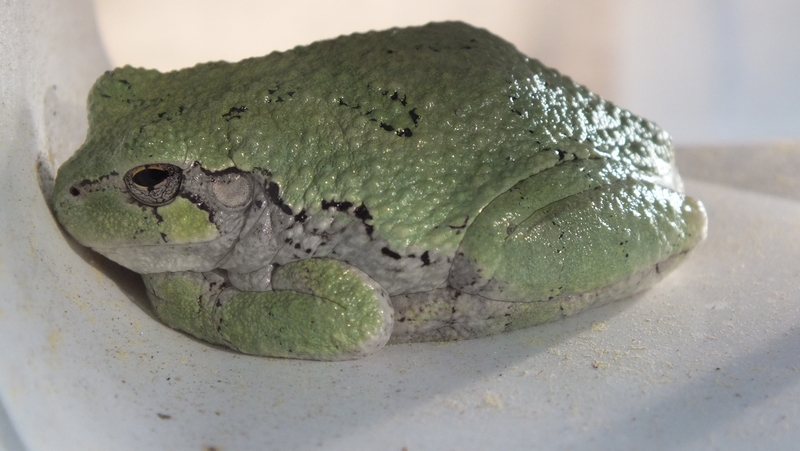 This is a gray tree frog, Hyla versicolor. As their species name suggests, they can change color to blend with their background, though not quite enough for this spot. Which, as it turned out, was here, in the warmth of the solar inverter. Perhaps, like the toad, it was catching insects that were attracted to the light. One of the most awe inspiring creatures we met this summer was the gray ratsnake (Pantherophis spiloides). This is the largest snake in Canada and it is truly impressive! We saw four or five of them, ranging in size from about 1 to 2 metres. Like all snakes in Southern Ontario, they are not venomous. As well, they are super calm, so easy to photograph. They just slide along their path at a steady rate, no rush and no aggression. But some take their welcome a bit for granted. I am certain, if the door had been open, this little guy would have come right in. Either way, it’s a bit unsettling. But they do eventually move on, and when they go, they go fast, slipping quickly across the surface of the water or sliding into crevasses between rocks on the shore. The one above is a young snake, maybe a couple feet long. As they get older, their stripes fade and they get darker, like this larger one. They move fast so it’s hard to get a good photo. 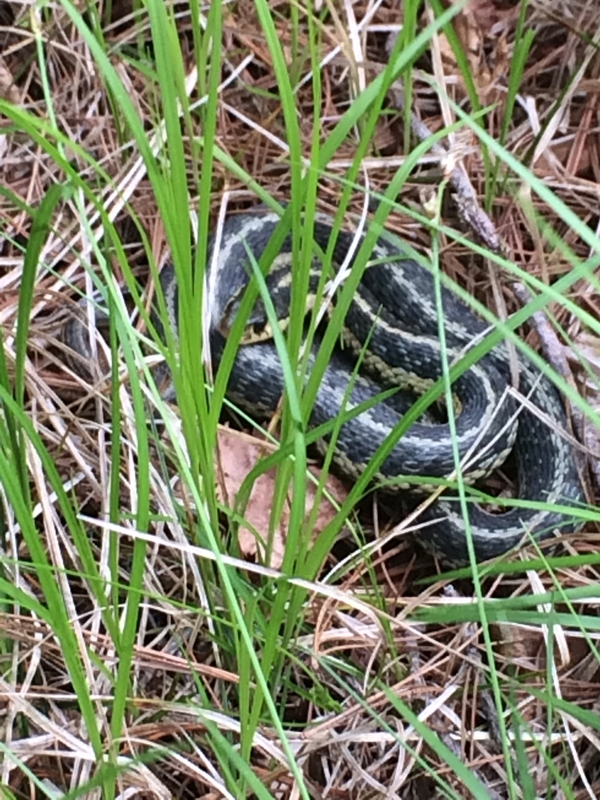 And we always seem to have garter snakes underfoot! They sun themselves on our trails, but we never notice them until we’re right on top of them. Then they scoot into the underbrush and become invisible. Unlike the rat snakes that seem to be passing through on their way somewhere, the garter snakes seem to have neighborhoods. We’ve seen the same one (well, presumably the same one) on the same section of trail a number of times. Can you find both ends of the snake in this picture? And finally, coming all the way back around to turtles where we started this adventure a few weeks ago, here’s one of the many pretty painted turtles we’ve seen — specifically a Midland painted turtle (Chrysemys picta marginata). How do I know? We often see these swimming along the lake shore, sunning on logs or crossing the road. This one was near the bottom of the driveway. Now that the days are shortening and we’ve had our first frost, all of these critters are hunkering down for winter. The land snakes will hibernate communally in rocky crevices. 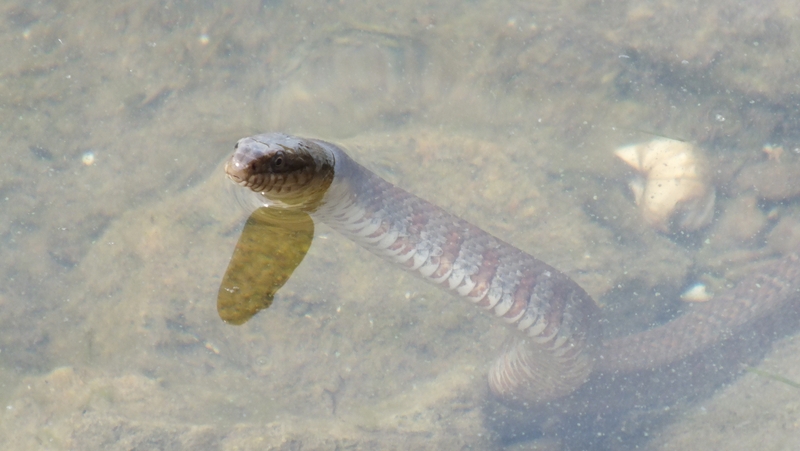 The water snakes will hibernate under ground, in crevices with rat snakes or even in the beaver lodge. The turtles and pickerel and green frogs will bury themselves in mud in the bottom of the beaver pond. The salamanders will hibernate deep underground, as will the toad. And the the gray tree frog, which is very freeze tolerant, will hibernate under a log or leaf litter and let itself freeze almost solid. And there they will stay until spring.